This article is about a branch of languages. It is not to be confused with German language. The Germanic languages are a branch of the Indo-European language family spoken natively by a population of about 515 million people[nb 1] mainly in Europe, North America, Oceania, and Southern Africa. 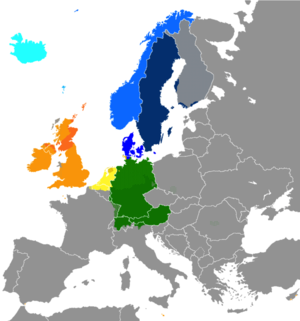 The West Germanic languages include the three most widely spoken Germanic languages: English with around 360-400 million native speakers;[nb 2] German, with over 100 million native speakers; and Dutch, with 24 million native speakers. Other West Germanic languages include Afrikaans, an offshoot of Dutch, with over 7.1 million native speakers; Low German, considered a separate collection of unstandardized dialects, with roughly 0.3 million native speakers and probably 6.7–10 million people who can understand it (at least 5 million in Germany and 1.7 million in the Netherlands); Yiddish, once used by approximately 13 million Jews in pre-World War II Europe, and Scots, both with 1.5 million native speakers; Limburgish varieties with roughly 1.3 million speakers along the Dutch–Belgian–German border; and the Frisian languages with over 0.5 million native speakers in the Netherlands and Germany. The East Germanic branch included Gothic, Burgundian, and Vandalic, all of which are now extinct. The last to die off was Crimean Gothic, spoken until the late 18th century in some isolated areas of Crimea. The SIL Ethnologue lists 48 different living Germanic languages, 41 of which belong to the Western branch and six to the Northern branch; it places Riograndenser Hunsrückisch German in neither of the categories, but it is often considered a German dialect by linguists. The total number of Germanic languages throughout history is unknown as some of them, especially the East Germanic languages, disappeared during or after the Migration Period. Some of the West Germanic languages also did not survive past the Migration Period, including Lombardic. As a result of World War II, the German language suffered a significant loss of Sprachraum, as well as moribundness and extinction of several of its dialects. In the 21st century, its dialects are dying out anyway[nb 3] due to Standard German gaining primacy. The common ancestor of all of the languages in this branch is called Proto-Germanic, also known as Common Germanic, which was spoken in about the middle of the 1st millennium BC in Iron Age Scandinavia. Proto-Germanic, along with all of its descendants, is characterised by a number of unique linguistic features, most famously the consonant change known as Grimm's law. Early varieties of Germanic entered history with the Germanic tribes moving south from Scandinavia in the 2nd century BC, to settle in the area of today's northern Germany and southern Denmark. English is an official language of Belize, Canada, Nigeria, Falkland Islands, Malta, New Zealand, Ireland, South Africa, Philippines, Jamaica, Dominica, Guyana, Trinidad and Tobago, American Samoa, Palau, St. Lucia, Grenada, Barbados, St. Vincent and the Grenadines, Puerto Rico, Guam, Hong Kong, Pakistan, India, Papua New Guinea, Vanuatu, the Solomon Islands and former British colonies in Asia, Africa and Oceania. Furthermore, it is the de facto language of the United Kingdom, the United States and Australia. It is also a recognised language in Nicaragua and Malaysia. American English-speakers make up the majority of all native Germanic speakers, including also making up the bulk of West Germanic speakers. German is an official language of Austria, Belgium, Germany, Liechtenstein, Luxembourg and Switzerland and has regional status in Italy, Poland, Namibia and Denmark. German also continues to be spoken as a minority language by immigrant communities in North America, South America, Central America, Mexico and Australia. A German dialect, Pennsylvania German, is still present amongst Anabaptist populations in Pennsylvania in the United States. Dutch is an official language of Aruba, Belgium, Curaçao, the Netherlands, Sint Maarten, and Suriname. 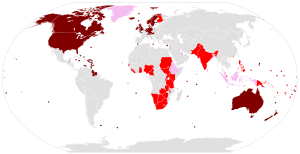 The Netherlands also colonised Indonesia, but Dutch was scrapped as an official language after Indonesian independence and today it is only used by older or traditionally educated people. Dutch was until 1925 an official language in South Africa but evolved in and was replaced by Afrikaans, a partially mutually intelligible daughter language of Dutch. Afrikaans is one of the 11 official languages in South Africa and is a lingua franca of Namibia. It is used in other Southern African nations, as well. Low German is a collection of very diverse dialects spoken in the northeast of the Netherlands and northern Germany. Scots is spoken in Lowland Scotland and parts of Ulster (where the local dialect is known as Ulster Scots). Frisian is spoken among half a million people who live on the southern fringes of the North Sea in the Netherlands, Germany, and Denmark. Luxembourgish is a Moselle Franconian dialect that is spoken mainly in the Grand Duchy of Luxembourg, where it is considered to be an official language. Similar varieties of Moselle Franconian are spoken in small parts of Belgium, France, and Germany. Yiddish, once a native language of some 11 to 13 million people, remains in use by some 1.5 million speakers in Jewish communities around the world, mainly in North America, Europe, Israel, and other regions with Jewish populations. Limburgish varieties are spoken in the Limburg and Rhineland regions, along the Dutch–Belgian–German border. In addition to being the official language in Sweden, Swedish is also spoken natively by the Swedish-speaking minority in Finland, which is a large part of the population along the coast of western and southern Finland. Swedish is also one of the two official languages in Finland, along with Finnish, and the only official language in the Åland Islands. Swedish is also spoken by some people in Estonia. Danish is an official language of Denmark and in its overseas territory of the Faroe Islands, and it is a lingua franca and language of education in its other overseas territory of Greenland, where it was one of the official languages until 2009. Danish is also spoken natively by the Danish minority in the German state of Schleswig-Holstein, where it is recognised as a minority language. Icelandic is the official language of Iceland. Faroese is the official language of the Faroe Islands, and it is also spoken by some people in Denmark. All Germanic languages are thought to be descended from a hypothetical Proto-Germanic, united by subjection to the sound shifts of Grimm's law and Verner's law. These probably took place during the Pre-Roman Iron Age of Northern Europe from c. 500 BC. Proto-Germanic itself was likely spoken after c. 500 BC, and Proto-Norse from the 2nd century AD and later is still quite close to reconstructed Proto-Germanic, but other common innovations separating Germanic from Proto-Indo-European suggest a common history of pre-Proto-Germanic speakers throughout the Nordic Bronze Age. From the time of their earliest attestation, the Germanic varieties are divided into three groups: West, East, and North Germanic. Their exact relation is difficult to determine from the sparse evidence of runic inscriptions. The western group would have formed in the late Jastorf culture, and the eastern group may be derived from the 1st-century variety of Gotland, leaving southern Sweden as the original location of the northern group. The earliest period of Elder Futhark (2nd to 4th centuries) predates the division in regional script variants, and linguistically essentially still reflect the Common Germanic stage. Vimose inscriptions AD 160, are the oldest Germanic writing. The earliest coherent Germanic text preserved is the 4th-century Gothic translation of the New Testament by Ulfilas. Early testimonies of West Germanic are in Old Frankish/Old Dutch (the 5th-century Bergakker inscription), Old High German (scattered words and sentences 6th century and coherent texts 9th century), and Old English (oldest texts 650, coherent texts 10th century). North Germanic is only attested in scattered runic inscriptions, as Proto-Norse, until it evolves into Old Norse by about 800. Longer runic inscriptions survive from the 8th and 9th centuries (Eggjum stone, Rök stone), longer texts in the Latin alphabet survive from the 12th century (Íslendingabók), and some skaldic poetry dates back to as early as the 9th century. By about the 10th century, the varieties had diverged enough to make inter-comprehensibility difficult. The linguistic contact of the Viking settlers of the Danelaw with the Anglo-Saxons left traces in the English language and is suspected to have facilitated the collapse of Old English grammar that resulted in Middle English from the 12th century. The East Germanic languages were marginalized from the end of the Migration period. The Burgundians, Goths, and Vandals became linguistically assimilated by their respective neighbors by about the 7th century, with only Crimean Gothic lingering on until the 18th century. During the early Middle Ages, the West Germanic languages were separated by the insular development of Middle English on one hand and by the High German consonant shift on the continent on the other, resulting in Upper German and Low Saxon, with graded intermediate Central German varieties. By early modern times, the span had extended into considerable differences, ranging from Highest Alemannic in the South to Northern Low Saxon in the North, and, although both extremes are considered German, they are hardly mutually intelligible. The southernmost varieties had completed the second sound shift, while the northern varieties remained unaffected by the consonant shift. The North Germanic languages, on the other hand, remained unified until well past 1000 AD, and in fact the mainland Scandinavian languages still largely retain mutual intelligibility into modern times. The main split in these languages is between the mainland languages and the island languages to the west, especially Icelandic, which has maintained the grammar of Old Norse virtually unchanged, while the mainland languages have diverged greatly. Germanic languages possess a number of defining features compared with other Indo-European languages. The sound changes known as Grimm's Law and Verner's Law, which shifted the values of all the Indo-European stop consonants (for example, original */t d dʰ/ became Germanic */θ t d/ in most cases; compare three with Latin tres, two with Latin duo, do with Sanskrit dha-). The recognition of these two sound laws were seminal events in the understanding of the regular nature of linguistic sound change and the development of the comparative method, which forms the basis of modern historical linguistics. The development of a strong stress on the first syllable of the word, which triggered significant phonological reduction of all other syllables. This is responsible for the reduction of most of the basic English, Norwegian, Danish and Swedish words into monosyllables, and the common impression of modern English and German as consonant-heavy languages. Examples are Proto-Germanic *strangiþō → strength, *aimaitijō → ant, *haubudan → head, *hauzijanan → hear, *harubistaz → German Herbst "autumn, harvest", *hagatusjō → German Hexe "witch, hag". A change known as Germanic umlaut, which modified vowel qualities when a high front vocalic segment (/i/, /iː/ or /j/) followed in the next syllable. Generally, back vowels were fronted, and front vowels were raised. In many languages, the modified vowels are indicated with a diaeresis (e.g., ä ö ü in German, pronounced /ɛ ø y/, respectively). This change resulted in pervasive alternations in related words — still extremely prominent in modern German but present only in remnants in modern English (e.g., mouse/mice, goose/geese, broad/breadth, tell/told, old/elder, foul/filth, gold/gild). Large numbers of vowel qualities. English is typical in this respect, with around 11–12 vowels in most dialects (not counting diphthongs). Standard Swedish has 17 pure vowels (monophthongs), standard German and Dutch 14, and Danish at least 11. The Amstetten dialect of Bavarian German has 13 distinctions among long vowels alone, one of the largest such inventories in the world. Verb second (V2) word order, which is uncommon cross-linguistically. Exactly one noun phrase or adverbial element must precede the verb; in particular, if an adverb or prepositional phrase precedes the verb, then the subject must immediately follow the finite verb. This is now largely absent in modern English, except in sentences beginning with "Here is," "There is," "Here comes," "There goes," and related expressions, as well as in a few relic sentences such as "Over went the boat" or "Pop Goes The Weasel", but is found in all other modern Germanic languages. The reduction of the various tense and aspect combinations of the Indo-European verbal system into only two: the present tense and the past tense (also called the preterite). A large class of verbs that use a dental suffix (/d/ or /t/) instead of vowel alternation (Indo-European ablaut) to indicate past tense. These are called the Germanic weak verbs; the remaining verbs with vowel ablaut are the Germanic strong verbs. A distinction in definiteness of a noun phrase that is marked by different sets of inflectional endings for adjectives, the so-called strong and weak adjectives. A similar development happened in the Balto-Slavic languages. This distinction has been lost in modern English but was present in Old English and remains in all other Germanic languages to various degrees. Some words with etymologies that are difficult to link to other Indo-European families but with variants that appear in almost all Germanic languages. See Germanic substrate hypothesis. Germanic umlaut only affected the North and West Germanic languages (which represent all modern Germanic languages) but not the now-extinct East Germanic languages, such as Gothic, nor Proto-Germanic, the common ancestor of all Germanic languages. The large inventory of vowel qualities is a later development, due to a combination of Germanic umlaut and the tendency in many Germanic languages for pairs of long/short vowels of originally identical quality to develop distinct qualities, with the length distinction sometimes eventually lost. Proto-Germanic had only five distinct vowel qualities, although there were more actual vowel phonemes because length and possibly nasality were phonemic. In modern German, long-short vowel pairs still exist but are also distinct in quality. Proto-Germanic probably had a more general S-O-V-I word order. However, the tendency toward V2 order may have already been present in latent form and may be related to Wackernagel's Law, an Indo-European law dictating that sentence clitics must be placed second. Roughly speaking, Germanic languages differ in how conservative or how progressive each language is with respect to an overall trend toward analyticity. Some, such as Icelandic and, to a lesser extent, German, have preserved much of the complex inflectional morphology inherited from Proto-Germanic (and in turn from Proto-Indo-European). Others, such as English, Swedish, and Afrikaans, have moved toward a largely analytic type. The subgroupings of the Germanic languages are defined by shared innovations. It is important to distinguish innovations from cases of linguistic conservatism. That is, if two languages in a family share a characteristic that is not observed in a third language, that is evidence of common ancestry of the two languages only if the characteristic is an innovation compared to the family's proto-language. The conversion of /ē1/ into /ā/ (vs. Gothic /ē/) in stressed syllables. In unstressed syllables, West Germanic also has this change, but North Germanic has shortened the vowel to /e/, then raised it to /i/. This suggests it was an areal change. The raising of final /ō/ to /u/ (Gothic lowers it to /a/). It is kept distinct from the nasal /ǭ/, which is not raised. The monophthongisation of /ai/ and /au/ to /ē/ and /ō/ in non-initial syllables (however, evidence for the development of /au/ in medial syllables is lacking). Loss of final /z/. In single-syllable words, Old High German retains it (as /r/), while it disappears in the other West Germanic languages. Change of [ð] (fricative allophone of /d/) to stop [d] in all environments. Change of /lþ/ to stop /ld/ (except word-finally). West Germanic gemination of consonants, except r, before /j/. This only occurred in short-stemmed words due to Sievers' law. Gemination of /p/, /t/, /k/ and /h/ is also observed before liquids. Labiovelar consonants become plain velar when non-initial. A particular type of umlaut /e-u-i/ > /i-u-i/. Changes to the 2nd person singular past-tense: Replacement of the past-singular stem vowel with the past-plural stem vowel, and substitution of the ending -t with -ī. Short forms (*stān, stēn, *gān, gēn) of the verbs for "stand" and "go"; but note that Crimean Gothic also has gēn. The development of a gerund. The so-called Ingvaeonic nasal spirant law, with loss of /n/ before voiceless fricatives: e.g. *munþ, *gans > Old English mūþ, gōs > "mouth, goose", but German Mund, Gans. The loss of the Germanic reflexive pronoun. The reduction of the three Germanic verbal plural forms into one form ending in -þ. The development of Class III weak verbs into a relic class consisting of four verbs (*sagjan "to say", *hugjan "to think", *habjan "to have", *libjan "to live"; cf. the numerous Old High German verbs in -ēn). The split of the Class II weak verb ending *-ō- into *-ō-/-ōja- (cf. Old English -ian < -ōjan, but Old High German -ōn). Development of a plural ending *-ōs in a-stem nouns (note, Gothic also has -ōs, but this is an independent development, caused by terminal devoicing of *-ōz; Old Frisian has -ar, which is thought to be a late borrowing from Danish). Cf. modern English plural -(e)s, but German plural -e.
Possibly, the monophthongization of Germanic *ai to ē/ā (this may represent independent changes in Old Saxon and Anglo-Frisian). Raising of nasalized a, ā into o, ō.
Anglo-Frisian brightening: Fronting of non-nasal a, ā to æ,ǣ when not followed by n or m.
Metathesis of CrV into CVr, where C represents any consonant and V any vowel. Monophthongization of ai into ā. The oldest Germanic languages all share a number of features, which are assumed to be inherited from Proto-Germanic. Phonologically, it includes the important sound changes known as Grimm's Law and Verner's Law, which introduced a large number of fricatives; late Proto-Indo-European had only one, /s/. The main vowel developments are the merging (in most circumstances) of long and short /a/ and /o/, producing short /a/ and long /ō/. That likewise affected the diphthongs, with PIE /ai/ and /oi/ merging into /ai/ and PIE /au/ and /ou/ merging into /au/. PIE /ei/ developed into long /ī/. PIE long /ē/ developed into a vowel denoted as /ē1/ (often assumed to be phonetically [ǣ]), while a new, fairly uncommon long vowel /ē2/ developed in varied and not completely understood circumstances. Proto-Germanic had no front rounded vowels, but all Germanic languages except for Gothic subsequently developed them through the process of i-umlaut. Proto-Germanic developed a strong stress accent on the first syllable of the root, but remnants of the original free PIE accent are visible due to Verner's Law, which was sensitive to this accent. That caused a steady erosion of vowels in unstressed syllables. In Proto-Germanic, that had progressed only to the point that absolutely-final short vowels (other than /i/ and /u/) were lost and absolutely-final long vowels were shortened, but all of the early literary languages show a more advanced state of vowel loss. This ultimately resulted in some languages (like Modern English) losing practically all vowels following the main stress and the consequent rise of a very large number of monosyllabic words. The following table shows the main outcomes of Proto-Germanic vowels and consonants in the various older languages. For vowels, only the outcomes in stressed syllables are shown. Outcomes in unstressed syllables are quite different, vary from language to language and depend on a number of other factors (such as whether the syllable was medial or final, whether the syllable was open or closed and (in some cases) whether the preceding syllable was light or heavy). C- means before a vowel (word-initially, or sometimes after a consonant). -C means after a vowel (word-finally or before a consonant). Word-final outcomes generally occurred after deletion of final short vowels, which occurred shortly after Proto-Germanic and is reflected in the history of all written languages except for Proto-Norse. The above three are given in the order C-, -C-, -C. If one is omitted, the previous one applies. For example, f, -[v]- means that [v] occurs after a vowel regardless of what follows. Something like a(…u) means "a if /u/ occurs in the next syllable". Something like a(n) means "a if /n/ immediately follows". Something like (n)a means "a if /n/ immediately precedes". It is generally agreed that the outcome of case 2 was pronounced [ɛː/ɔː] in Gothic, distinct from the vowels written ⟨e⟩ and ⟨o⟩, which were pronounced [eː/oː]. Likewise, it is generally agreed that the outcomes of cases 3 and 4 were pronounced [ɛ] and [ɔ] in Gothic. However, there is some argument over whether the outcomes of case 1 were still pronounced as diphthongs [ai/au], as in Proto-Germanic, or had merged with case 2 as monophthongs [ɛː/ɔː]. There is some historical evidence (particularly from Latin spelling variations of Gaut- vs. Gōt-, used to represent the name of the Goths) that the Proto-Germanic diphthongs had changed into monophthongs shortly before (i.e., within a century of) the time of Wulfila, who designed the Gothic alphabet and wrote the Gothic Bible c. 360 AD. This accords with the fact that Wulfila used the same symbols ⟨ai/au⟩ to represent all the outcomes, despite the fact that the spellings ⟨aj/aw⟩ were available to unambiguously represent diphthongs (and, in fact, alternate with ⟨ai/au⟩ in a number of nominal and verbal paradigms). The use of the spelling ⟨ai⟩ to represent a monophthong [ɛ(ː)] was evidently in imitation of 4th century Greek, where ⟨ai⟩ likewise stood for [ɛː], and ⟨au⟩ was apparently created by analogy. Consistent with many sources, such as Bennett (1980), the phonology described here is that of "Pre-Gothic" (i.e., the phonology of Gothic just before the monophthongization of /ai/ and /au/). ^ a b c d e f g In Old Norse, non-rounded vowels become rounded when a /u/ or /w/ follows in the next syllable, in a process known as u-umlaut. Some vowels were affected similarly, but only by a following /w/; this process is sometimes termed w-umlaut. These processes operated after i-umlaut. U-umlaut (by a following /u/ or /w/) caused /a/, /ja/ (broken /e/), /aː/, and /e/ to round to /ɔ/ (written o̧), /jɔ/ (written jo̧), /ɔː/ (written ó̧ and later unrounded again to /aː/), and /ø/, respectively. The vowels /i/ and /ai/ rounded to /y/ and /ey/, respectively, only before /w/. Short /a/ become /ø/ by a combination of i-umlaut and w-umlaut. In Old High German, /iu/ (from Proto-Germanic /eu/,/iu/) became /io/ before a non-high vowel in the next syllable. In Old English, /æ/ (from Proto-Germanic /a/) became /a/ before /a/ in the next syllable. All of these processes were blocked in an i-umlaut context (i.e. by a following /j/). ^ a b c d e The diphthongal results are due to Old English breaking. In general, front vowels break into diphthongs before some subset of h, w, rC, and lC, where C is a consonant. The diphthong /æa/ is written ea; /eo/ is written eo; /iu/ is written io; and /iy/ is written ie. All diphthongs umlaut to /iy/ ie. All diphthongs occur both long and short. Note that there is significant dispute about the actual pronunciation of io and (especially) ie. Their interpretation as /iu/ and /iy/, respectively, follows Lass (1994), Old English: A historical linguistic companion. ^ a b c d e f g h i j All languages except Gothic were affected by i-umlaut. This was the most significant of the various umlaut processes operating in the Germanic languages, and caused back vowels to become fronted, and front vowels to be raised, when /i/, /iː/ or /j/ followed in the next syllable. The term i-umlaut actually refers to two separate processes that both were triggered in the same environment. The earlier process raised /e/ and /eu/ to /i/ and /iu/, respectively, and may have operated still in Proto-Germanic (with its effects in Gothic obscured due to later changes). The later process affected all back vowels and some front vowels; it operated independently in the various languages, occurring at differing times with differing results. Old English was the earliest and most-affected language, with nearly all vowels affected. Old High German was the last language to be affected; the only written evidence of the process is with short /a/, which is umlauted to /e/. However, later evidence suggests that other back vowels were also affected, perhaps still sub-phonemically in Old High German times. These are indicated with a diaeresis or "umlaut" symbol (two dots) placed over the affected vowels. ^ Proto-Germanic /e/ usually became Old Norse /ja/ by a process known as vowel breaking. ^ Before Proto-Germanic /x/, /xʷ/ or /r/, but not before Proto-Germanic /z/ (which only merged with /r/ much later in North Germanic). Cf. Old Norse árr (masc.) "messenger" < PG *airuz, ár (fem.) "oar" < PG *airō, vs. eir (fem.) "honor" < PG *aizō, eir (neut.) "bronze" < PG *aizan. (All four become ār in Old English; in Gothic, they become, respectively, airus, (unattested), *aiza, *aiz.) Cf. Köbler, Gerhard. "Altenglisches Wörterbuch" (PDF). ^ Before /r/, /h/ (including when derived from Proto-Germanic /xʷ/) or /w/, or word-finally. ^ a b Before /h/ (including when derived from Proto-Germanic /xʷ/) or before any dental consonant, i.e. /s/,/z/,/þ/,/t/,/d/,/r/,/l/,/n/. ^ Before any dental consonant, i.e. /s/,/z/,/þ/,/t/,/d/,/r/,/l/,/n/. ^ a b The result of the High German consonant shift produced a different sort of s than the original Proto-Germanic s. The former was written ⟨z⟩ and the latter ⟨s⟩. It is thought that the former was a dental /s/, somewhat like in English, while the latter was an "apicoalveolar" sound as in modern European Spanish, sounding somewhere between English /s/ and /ʃ/.Joos (1952)) Modern standard German has /ʃ/ for this sound in some contexts, e.g. initially before a consonant (schlimm cf. English slim; Stand /ʃtant/, cf. English stand), and after /r/ (Arsch, cf. English arse). A number of modern southern German dialects have /ʃ/ for this sound before all consonants, whether or not word-initially. ^ a b c Old English palatalizes /k,g,ɣ/ to /tʃ,dʒ,j/ near a front vowel. The sounds /k/ and /ɣ/ palatalized initially before any front vowel. Elsewhere /ɣ/ palatalized before /j/ or before or after any front vowel, where /k/ and /g/ (which occurred only in the combinations /gg/, /ng/) palatalized before /j/, or either before or after /i,iː/. ^ a b c Voiced fricatives were originally allophones of voiced stops, when occurring after a vowel or after certain consonants (and for /g/, also initially — hard [g] occurred only in the combinations /gg/, /ng/). In Old Norse and Old English, voiceless fricatives became voiced between vowels (and finally after a vowel in Old Norse); as a result, voiced fricatives were reanalyzed as allophones of voiceless fricatives. In Old High German, all voiced fricatives hardened into stops. ^ In the early periods of the various languages, the sound written /r/ may have been strongly velarized, as in modern American English (Lass 1994); this is one possible explanation for the various processes were triggered by h (probably [x]) and r.
^ a b Old English and Old Norse lose /n/ before certain consonants, with the previous vowel lengthened (in Old Norse, the following consonant is also lengthened). ^ /n/ lost finally and before /s,p,t,k/, but not before other consonants. ^ a b Proto-Germanic /j/ and /w/ were often lost between vowels in all languages, often with /j/ or /w/ later reappearing to break the hiatus, and not always corresponding to the sound previously present. After a consonant, Gothic consistently preserved /j/ and /w/, but most languages deleted /j/ (after triggering i-umlaut), and /w/ sometimes disappeared. The loss of /j/ after a consonant occurred in the various languages at different times and to differing degrees. For example, /j/ was still present in most circumstances in written Old Saxon, and was still present in Old Norse when a short vowel preceded and a back vowel followed; but in Old English and Old High German, /j/ only remained after an /r/ preceded by a short vowel. The oldest Germanic languages have the typical complex inflected morphology of old Indo-European languages, with four or five noun cases; verbs marked for person, number, tense and mood; multiple noun and verb classes; few or no articles; and rather free word order. The old Germanic languages are famous for having only two tenses (present and past), with three PIE past-tense aspects (imperfect, aorist, and perfect/stative) merged into one and no new tenses (future, pluperfect, etc.) developing. There were three moods: indicative, subjunctive (developed from the PIE optative mood) and imperative. Gothic verbs had a number of archaic features inherited from PIE that were lost in the other Germanic languages with few traces, including dual endings, an inflected passive voice (derived from the PIE mediopassive voice), and a class of verbs with reduplication in the past tense (derived from the PIE perfect). The complex tense system of modern English (e.g. In three months, the house will still be being built or If you had not acted so stupidly, we would never have been caught) is almost entirely due to subsequent developments (although paralleled in many of the other Germanic languages). Among the primary innovations in Proto-Germanic are the preterite present verbs, a special set of verbs whose present tense looks like the past tense of other verbs and which is the origin of most modal verbs in English; a past-tense ending (in the so-called "weak verbs", marked with -ed in English) that appears variously as /d/ or /t/, often assumed to be derived from the verb "to do"; and two separate sets of adjective endings, originally corresponding to a distinction between indefinite semantics ("a man", with a combination of PIE adjective and pronoun endings) and definite semantics ("the man", with endings derived from PIE n-stem nouns). Note that most modern Germanic languages have lost most of the inherited inflectional morphology as a result of the steady attrition of unstressed endings triggered by the strong initial stress. (Contrast, for example, the Balto-Slavic languages, which have largely kept the Indo-European pitch accent and consequently preserved much of the inherited morphology.) Icelandic and to a lesser extent modern German best preserve the Proto–Germanic inflectional system, with four noun cases, three genders, and well-marked verbs. English and Afrikaans are at the other extreme, with almost no remaining inflectional morphology. Originally, adjectives in Proto-Indo-European followed the same declensional classes as nouns. The most common class (the o/ā class) used a combination of o-stem endings for masculine and neuter genders and ā-stems ending for feminine genders, but other common classes (e.g. the i class and u class) used endings from a single vowel-stem declension for all genders, and various other classes existed that were based on other declensions. A quite different set of "pronominal" endings was used for pronouns, determiners, and words with related semantics (e.g., "all", "only"). An important innovation in Proto-Germanic was the development of two separate sets of adjective endings, originally corresponding to a distinction between indefinite semantics ("a man") and definite semantics ("the man"). The endings of indefinite adjectives were derived from a combination of pronominal endings with one of the common vowel-stem adjective declensions – usually the o/ā class (often termed the a/ō class in the specific context of the Germanic languages) but sometimes the i or u classes. Definite adjectives, however, had endings based on n-stem nouns. Originally both types of adjectives could be used by themselves, but already by Proto-Germanic times a pattern evolved whereby definite adjectives had to be accompanied by a determiner with definite semantics (e.g., a definite article, demonstrative pronoun, possessive pronoun, or the like), while indefinite adjectives were used in other circumstances (either accompanied by a word with indefinite semantics such as "a", "one", or "some" or unaccompanied). In the 19th century, the two types of adjectives – indefinite and definite – were respectively termed "strong" and "weak", names which are still commonly used. These names were based on the appearance of the two sets of endings in modern German. In German, the distinctive case endings formerly present on nouns have largely disappeared, with the result that the load of distinguishing one case from another is almost entirely carried by determiners and adjectives. Furthermore, due to regular sound change, the various definite (n-stem) adjective endings coalesced to the point where only two endings (-e and -en) remain in modern German to express the sixteen possible inflectional categories of the language (masculine/feminine/neuter/plural crossed with nominative/accusative/dative/genitive – modern German merges all genders in the plural). The indefinite (a/ō-stem) adjective endings were less affected by sound change, with six endings remaining (-, -e, -es, -er, -em, -en), cleverly distributed in a way that is capable of expressing the various inflectional categories without too much ambiguity. As a result, the definite endings were thought of as too "weak" to carry inflectional meaning and in need of "strengthening" by the presence of an accompanying determiner, while the indefinite endings were viewed as "strong" enough to indicate the inflectional categories even when standing alone. (This view is enhanced by the fact that modern German largely uses weak-ending adjectives when accompanying an indefinite article, and hence the indefinite/definite distinction no longer clearly applies.) By analogy, the terms "strong" and "weak" were extended to the corresponding noun classes, with a-stem and ō-stem nouns termed "strong" and n-stem nouns termed "weak". However, in Proto-Germanic – and still in Gothic, the most conservative Germanic language – the terms "strong" and "weak" are not clearly appropriate. For one thing, there were a large number of noun declensions. The a-stem, ō-stem, and n-stem declensions were the most common and represented targets into which the other declensions were eventually absorbed, but this process occurred only gradually. Originally the n-stem declension was not a single declension but a set of separate declensions (e.g., -an, -ōn, -īn) with related endings, and these endings were in no way any "weaker" than the endings of any other declensions. (For example, among the eight possible inflectional categories of a noun — singular/plural crossed with nominative/accusative/dative/genitive — masculine an-stem nouns in Gothic include seven endings, and feminine ōn-stem nouns include six endings, meaning there is very little ambiguity of "weakness" in these endings and in fact much less than in the German "strong" endings.) Although it is possible to group the various noun declensions into three basic categories — vowel-stem, n-stem, and other-consonant-stem (a.k.a. "minor declensions") — the vowel-stem nouns do not display any sort of unity in their endings that supports grouping them together with each other but separate from the n-stem endings. It is only in later languages that the binary distinction between "strong" and "weak" nouns become more relevant. In Old English, the n-stem nouns form a single, clear class, but the masculine a-stem and feminine ō-stem nouns have little in common with each other, and neither has much similarity to the small class of u-stem nouns. Similarly, in Old Norse, the masculine a-stem and feminine ō-stem nouns have little in common with each other, and the continuations of the masculine an-stem and feminine ōn/īn-stem nouns are also quite distinct. It is only in Middle Dutch and modern German that the various vowel-stem nouns have merged to the point that a binary strong/weak distinction clearly applies. As a result, newer grammatical descriptions of the Germanic languages often avoid the terms "strong" and "weak" except in conjunction with German itself, preferring instead to use the terms "indefinite" and "definite" for adjectives and to distinguish nouns by their actual stem class. In English, both two sets of adjective endings were lost entirely in the late Middle English period. Note that divisions between and among subfamilies of Germanic are rarely precisely defined; most form continuous clines, with adjacent varieties being mutually intelligible and more separated ones not. Within the Germanic language family is East Germanic, West Germanic, and North Germanic. However, East Germanic languages became extinct several centuries ago. The table below shows the succession of the significant historical stages of each language (horizontally) and their approximate groupings in subfamilies (vertically). Vertical sequence within each group does not imply a measure of greater or lesser similarity. ^1 There are conflicting opinions on the classification of Lombardic. It has also been classified as close to Old Saxon. ^2 Late Middle Ages refers to the post-Black Death period. Especially for the language situation in Norway this event was important. ^3 From Early Northern Middle English. McClure gives Northumbrian Old English. In the Oxford Companion to the English Language (p. 894) the 'sources' of Scots are described as "the Old English of the Kingdom of Bernicia" and "the Scandinavian-influenced English of immigrants from Northern and Midland England in the 12-13c [...]." The historical stages 'Early—Middle—Modern Scots' are used, for example, in the "Concise Scots Dictionary" and "A Dictionary of the Older Scottish Tongue". ^4 The speakers of Norn were assimilated to speak Modern Scots varieties (Insular Scots). ^5 Modern Gutnish (Gutamål), the direct descendant of Old Gutnish (Gutniska), has been marginalized by the Gotlandic dialect/accent of Standard Swedish (Gotländska). All living Germanic languages belong either to the West Germanic or to the North Germanic branch. The West Germanic group is the larger by far, further subdivided into Anglo-Frisian on one hand and Continental West Germanic on the other. Anglo-Frisian notably includes English and all its variants, while Continental West Germanic includes German (standard register and dialects), as well as Dutch (standard register and dialects). Modern classification looks like this. For a full classification, see List of Germanic languages. The earliest evidence of Germanic languages comes from names recorded in the 1st century by Tacitus (especially from his work Germania), but the earliest Germanic writing occurs in a single instance in the 2nd century BC on the Negau helmet. From roughly the 2nd century AD, certain speakers of early Germanic varieties developed the Elder Futhark, an early form of the runic alphabet. Early runic inscriptions also are largely limited to personal names and difficult to interpret. The Gothic language was written in the Gothic alphabet developed by Bishop Ulfilas for his translation of the Bible in the 4th century. Later, Christian priests and monks who spoke and read Latin in addition to their native Germanic varieties began writing the Germanic languages with slightly modified Latin letters. However, throughout the Viking Age, runic alphabets remained in common use in Scandinavia. In addition to the standard Latin script, many Germanic languages use a variety of accent marks and extra letters, including the ß (Eszett), Ĳ, Ø, Æ, Å, Ä, Ü, Ö, Ð, Ȝ, and the Latinized runes Þ and Ƿ (with its Latin counterpart W). In print, German used to be prevalently set in blackletter typefaces (e.g., fraktur or schwabacher) until the 1940s, when Kurrent and, since the early 20th century, Sütterlin were used for German handwriting. Yiddish is written using an adapted Hebrew alphabet. Several of the terms in the table below have had semantic drift. For example, the form Sterben and other terms for die are cognates with the English word starve. There is also at least one example of a common borrowing from a non-Germanic source (ounce and its cognates from Latin). ^ Estimates of native speakers of the Germanic languages vary from 450 million through 500 million and up to more than 520 million. Much of the uncertainty is caused by the rapid spread of the English language and conflicting estimates of its native speakers. Here used is the most probable estimate (currently 515 million) as determined by Statistics section below. ^ There are various conflicting estimates of L1/native users of English, from 360 million up to 430 million and more. English is a current lingua franca, which is spreading rapidly, often replacing other languages throughout the world, thus making it difficult to provide one definitive number. It is a rare case of a language with many more secondary speakers than natives. ^ This phenomenon is not restricted to German, but constitutes a common linguistic development affecting all modern day living major languages with a complex set of dialects. As local dialects increasingly cease to be used, they are usually being replaced by a standardized version of the language. ^ It uses the lowest estimate for English (360 million). ^ Estimates for English, German and Dutch are less precise than these for the rest of the Germanic languages. These three languages are the most widely spoken ones; the rest are largely concentrated in specific places (excluding Yiddish and Afrikaans), so precise estimates are easier to get. ^ Estimate includes most High German dialects classified into the German language spectrum, while leaves some out like the Yiddish language. Low German is regarded separately. ^ All other Germanic languages, including Gutnish, Dalecarlian dialects (among them Elfdalian) and any other minor languages. ^ Estimates of native speakers of the Germanic languages vary from 450 million through 500 million and up to more than 520 million. Much of the uncertainty is caused by the rapid spread of the English language and conflicting estimates of its native speakers. Here used is the most probable estimate as determined by Statistics section. ^ Hammarström, Harald; Forkel, Robert; Haspelmath, Martin, eds. (2017). "Germanic". Glottolog 3.0. Jena, Germany: Max Planck Institute for the Science of Human History. ^ a b c König & van der Auwera (1994). ^ a b "Världens 100 största språk 2010" [The world's 100 largest languages in 2010]. Nationalencyklopedin (in Swedish). 2010. Retrieved 12 February 2014. ^ SIL Ethnologue (2006). 95 million speakers of Standard German; 105 million including Middle and Upper German dialects; 120 million including Low German and Yiddish. ^ a b "Gechattet wird auf Plattdeusch". Noz.de. Retrieved 2014-03-14. ^ The Other Languages of Europe: Demographic, Sociolinguistic, and Educational Perspectives by Guus Extra, Durk Gorter; Multilingual Matters, 2001 – 454; page 10. ^ a b Dovid Katz. "YIDDISH" (PDF). YIVO. Archived from the original (PDF) on March 22, 2012. Retrieved 20 December 2015. ^ "1 Cor. 13:1-12". lrc.la.utexas.edu. Retrieved 2016-08-03. ^ Heine, Matthias (16 November 2017). "Sprache und Mundart: Das Aussterben der deutschen Dialekte" – via www.welt.de. ^ "Feiten en cijfers - Taalunieversum". taalunieversum.org. ^ "List of declarations made with respect to treaty No. 148". Conventions.coe.int. Retrieved 9 September 2012. ^ "Lëtzebuergesch - the national language". Retrieved 2018-02-14. ^ Vasagar, Jeevan (18 June 2013). "German 'should be a working language of EU', says Merkel's party" – via www.telegraph.co.uk. ^ "Nederlands, wereldtaal". Nederlandse Taalunie. 2010. Retrieved 2011-04-07. ^ "Statistics Iceland". Statistics Iceland. ^ Ringe (2006), p. 67. ^ These alternations are no longer easily distinguishable from vowel alternations due to earlier changes (e.g. Indo-European ablaut, as in write/wrote/written, sing/sang/sung, hold/held) or later changes (e.g. vowel shortening in Middle English, as in wide/width, lead/led). ^ Wang et al. (2012), p. 657. ^ Basbøll & Jacobsen (2003). ^ Ladefoged, Peter; Maddieson, Ian (1996). The Sounds of the World's Languages. Oxford: Blackwell. p. 290. ISBN 0-631-19814-8. ^ Campbell (1983), p. 139. ^ Bethge (1900), p. 361. ^ Schumacher (2005), p. 603f. ^ Campbell (1983), p. 169. ^ Lass & Anderson (1975). ^ a b Lass (1994). ^ Mitchell & Robinson (1992). ^ Wright & Wright (1925). ^ In speech, the genitive is usually replaced with vom + dative, or with the dative alone after prepositions. ^ The use of -e in the dative has become increasingly uncommon, and is found only in a few fixed phrases (e.g. zu Hause "at home") and in certain archaizing literary styles. ^ Of questionable etymology. Possibly an old locative. ^ McClure (1991) in The Cambridge History of the English Language Vol. 5. p. 23. ^ Cercignani, Fausto, The Elaboration of the Gothic Alphabet and Orthography, in "Indogermanische Forschungen", 93, 1988, pp. 168–185. ^ The spellings used are those based on the prestigious literary conventions described in the article Modern Scots. Others spelling variants may be encountered in written Scots, e.g. aipil (apple), buik (book), huik (hook), houss (house) and monie (many). ^ The cognate means 'potato'. The correct word is 'Súrepli'. ^ Attested meaning 'letter', but also means beech in other Germanic languages, cf. Russian buk 'beech', bukva 'letter', maybe from Gothic. ^ Now only used in compound words such as hoofpyn (headache) and metaphorically, such as hoofstad (capital city). ^ a b c d e f g From an old Latin borrowing, akin to "cup". ^ a b Archaic: now only used in compound words such as 'heimwee' (homesickness). ^ a b c d From a compound phrase akin to "to house"
^ ongel is also used for fishing hook. ^ a b c The cognate orm usually means 'snake'. Basbøll, Hans; Jacobsen, Henrik Galberg (2003). Take Danish, for Instance: Linguistic Studies in Honour of Hans Basbøll Presented on the Occasion of His 60th Birthday, 12 July 2003. University Press of Southern Denmark. pp. 41–57. ISBN 9788778388261. Bethge, Richard (1900). "Konjugation des Urgermanischen". In Ferdinand Dieter (ed.). Laut- und Formenlehre der altgermanischen Dialekte (2. Halbband: Formenlehre). Leipzig: Reisland. Jacobs, Neil G. (2005). Yiddish: A Linguistic Introduction. Cambridge University Press. ISBN 9780521772150 – via Google Books. Joos, Martin (1952). "The Medieval Sibilants". Language. 28 (2): 222–231. doi:10.2307/410515. JSTOR 410515. Todd, Malcolm (1992). The Early Germans. Blackwell Publishing. Wang, Chuan-Chao; Ding, Qi-Liang; Tao, Huan; Li, Hui (2012). "Comment on "Phonemic Diversity Supports a Serial Founder Effect Model of Language Expansion from Africa"". Science. 335 (6069): 657. doi:10.1126/science.1207846. ISSN 0036-8075. PMID 22323803. König, Ekkehard; van der Auwera, Johan (1994). The Germanic languages. London: Routledge. Helfenstein, James (1870). A comparative grammar of the Teutonic languages. London: MacMillan and Co.
Ringe, Don (2006). A linguistic history of English: From Proto-Indo-European to Proto-Germanic. Oxford: Oxford University Press. Bennett, William H. (1980). An introduction to the Gothic language. New York: Modern Language Association of America. Wright, Joseph C. (1919). Grammar of the Gothic language. London: Oxford University Press. Zoëga, Geir T. (2004). A Concise Dictionary of Old Icelandic. Toronto: University of Toronto Press. Campbell, Alistair (1983). Old English Grammar. Clarendon Press. ISBN 9780198119432. Diamond, Robert E. (1970). Old English grammar and reader. Detroit: Wayne State University Press. Hall, J.R. (1984). A concise Anglo–Saxon dictionary, 4th edition. Toronto: University of Toronto Press. Lass, Roger (1994). Old English: A historical linguistic companion. Cambridge: Cambridge University Press. Lass, Roger; Anderson, John M. (1975). Old English phonology. Cambridge: Cambridge University Press. Mitchell, Bruce; Robinson, Fred C. (1992). A guide to Old English, 5th edition. Cambridge: Blackwell. Robinson, Orrin (1992). Old English and its closest relatives. Stanford: Stanford University Press. Wright, Joseph; Wright, Mary Elizabeth (1925). Old English grammar, 3rd edition. London: Oxford University Press. Wright, Joseph (1906). An Old High German primer, 2nd edition. Oxford: Clarendon Press. Waterman, John C. (1976). A history of the German language. Prospect Heights, Illinois: Waveland Press. Wikisource has the text of an 1879 American Cyclopædia article about Germanic languages.